Make a fire in your backyard. Make a fire in your backyard! 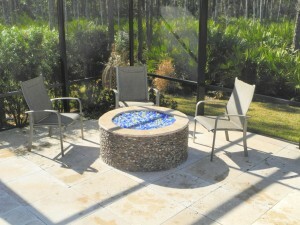 A fire in an outdoor fire pit or fireplace can be a great way to entertain family and friends during the holidays. With the mild winters we see in Northeast Florida there are many opportunities to enjoy a fire in your backyard. We had a fire in our backyard on Thanksgiving and it was the highlight of the evening for everyone especially the kids. 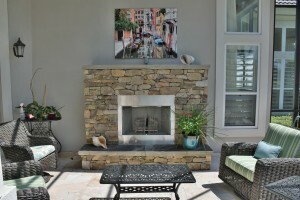 A custom built fireplace or pit can enhance the beauty of your space even when you don’t have a fire going. We can custom design and build a fireplace or pit for you that is wood-burning or with the convenience of gas. 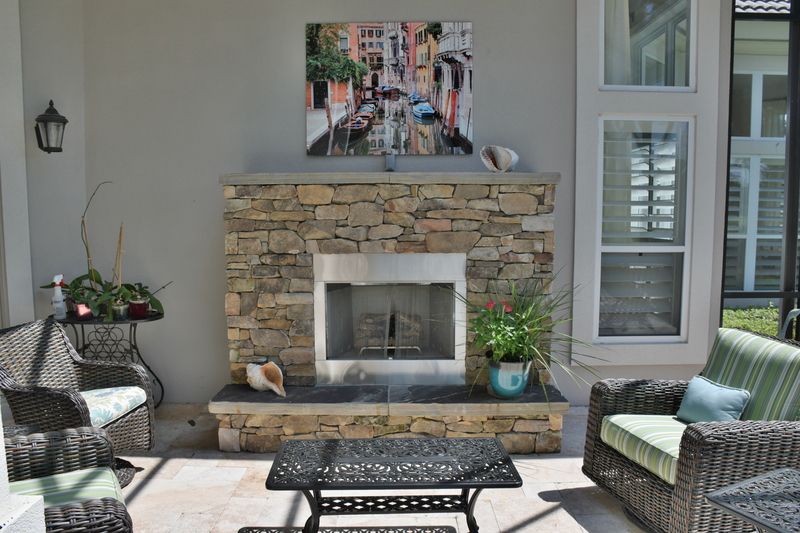 If your space or budget is too small for a custom built fire pit or fireplace we offer fire tables that can be moved and offer storage of a 20 pound propane tank within the cabinet. Give us a call to get your project started! If You’re Having a Party, You Have to Have an Evo! Have you heard of an Evo yet? If not, take a close look at how much fun outdoor grilling can be. The Evo flattop grill is fueled by propane or natural gas. It will enable you to cook foods you never thought you could outside and it’s so easy. The Evo makes great traditional grilling foods like steaks, burgers and chicken. The best thing about the Evo is you can cook so many healthy foods that are so difficult to cook on a traditional grill like shrimp, scallops, blackened fish and fresh veggies (stir fry is delicious!). My favorite thing to cook is breakfast. The Evo makes great pancakes, eggs, hash browns and awesome bacon! The Evo is so easy to clean and is a great source of entertainment. You’ll be the envy of your neighborhood. 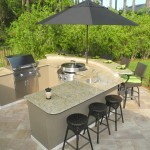 Evo is available as a stand alone grill or can be built into an outdoor kitchen. Call us for pricing and design ideas. Summer is a great time to enjoy your backyard. 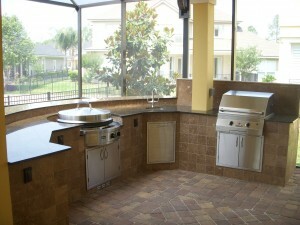 Impress your family and friends with some delicious meals cooked fresh in your new outdoor kitchen. Not only is the food great tasting but in most cases it is healthier too. One of our customers told me he lost weight because he now cooks his dinners on his new grill instead of eating heavier meals he used to cook inside. 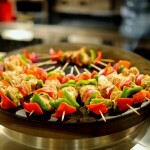 It is easy to get creative with fresh vegetables and some great tasting meat right on the grill. There are so many sauces and rubs to choose from, the possibilities are endless! 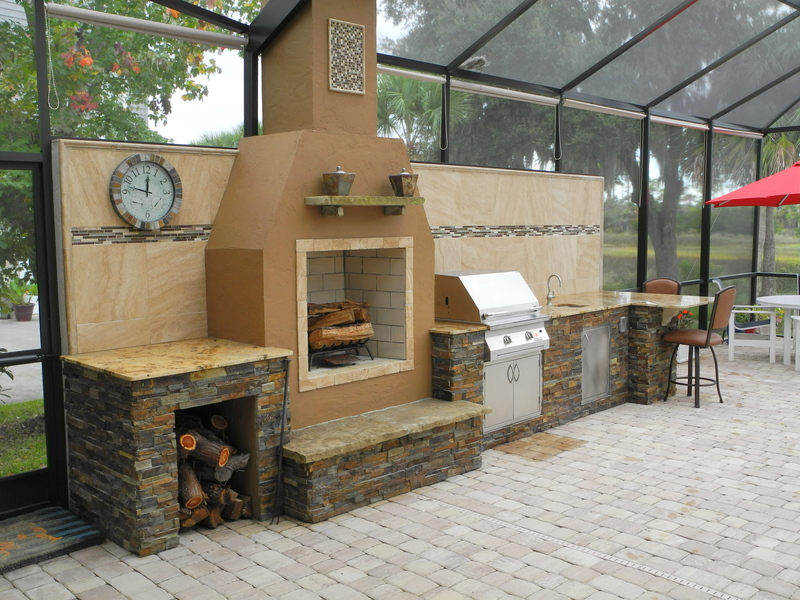 Do you want to be able to cook just about everything outside? 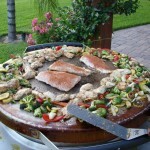 Check out the Evo Flattop Grill. The Evo gives you a large cooking surface where you can cook everything from pancakes and bacon to shrimp stir fry. 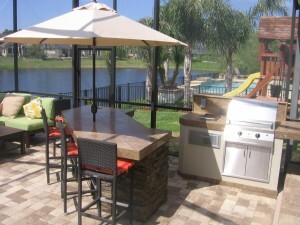 Enjoy the warm summer nights relaxing around your outdoor kitchen. Want to beat the heat? 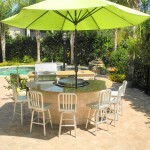 An outdoor umbrella mounted right into your countertop is a great way to keep yourself and your food cool.